Property Info: 5BR, 5.5BA Waterfront Home, with approx. 3100 sq. ft.
Sailmakers Place condo in Pensacola Florida. Exceptional views from this 3100 s.f. condo overlooking the Intracoastal Waterway. The second floor features the living area,kitchen and master bedroom, while the remaining four bedrooms with adjoining bathrooms are on the first floor. Enjoy balcony access and the breathtaking views from both levels. In addition to travertine floors, this spacious unit also offers granite counters, stainless steel appliances, and large windows providing plenty of natural light. Additionally, this unit comes with an indoor storage locker and three parking spots (maximum). Sailmakers Place amenities include a zero entry pool, beach area on the Intracoastal, boat dock, fitness area, and theater. Lost Key golf course is located across the street and the public gulf beaches of Perdido Key are within walking/biking distance. Convenient to the National Seashore, NAS Pensacola, great restaurants and shopping….come see why the Perdido Key is a popular family vacation destination. 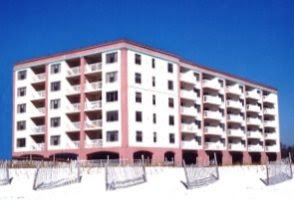 Visit Perdido Key FL Condo, Sailmakers Place. Perdido Key is a barrier island on the Gulf Coast in Northwest Florida, popular for its’ white beaches and emerald waters, beach-combing, fishing and sailing are a part of everyday life. Perdido Key’s unspoiled beaches are the island’s main attractions – with sea oats, bunch grass and beach grass, making it a popular beach vacation destination; the warm climate allows for an abundance of outdoor activities, championship golf courses, bird-watching, deep-sea fishing and nature hikes. For accommodations, choose from nearby national hotel and motel chains, camping or a variety of beach homes for rent by owner and/or management companies. There are numerous venues for nightlife, from family entertainment to a legendary roadhouse, enjoy from a selection of plays at nearby venues or just relax while listening to local musicians. When hunger strikes, enjoy one of many Perdido Key eateries offering some of the best seafood anywhere…fried, grilled, steamed, blackened, etc. Whether you’re ready for fun and adventure, a carefree day on the beach, or a succulent meal, or your own Perdido Key condo – you can find it all on Florida’s Gulf Coast.